Fair Trade Enterprises fight poverty. 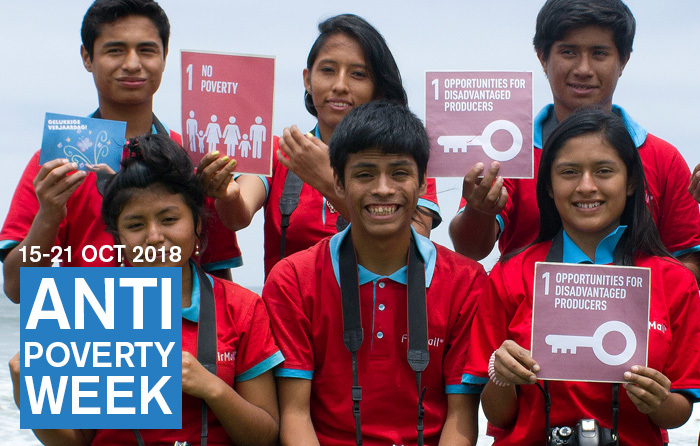 This is why the WFTO observes Anti-Poverty Week from 15 from 21 October 2018 to celebrate the efforts of our members to end poverty. This week, we will highlight the innovative models from across our global community of Fair Trade Enterprises , who provide long term economic security to small farmers and artisans and drive economic opportunity in their communities. The campaign will run mostly on social media, focusing on raising awareness on the role of businesses and consumers in fighting poverty. This is part of the broader coalition and call to action that is gathered under the umbrella of ‘Trade Fair, Live Fair’. Trade Fair: WFTO members are redefining business through mission-led models that put people and the planet first. These Fair Trade Enterprises are pioneering innovative models that ensure small and marginalised producers can grow and thrive through their own work. The strong social focus of their business empowers farmers and artisans so they can break the cycle of poverty. Live Fair: sustainable consumption is the other side of the coin that makes alleviation of poverty possible. Everything we purchase has a profound but often hidden impact on the supply chains behind the products we bring home. We want to show that this impact is actual and real. Sustainable consumption patterns and lifestyles can make a difference in supporting a different landscape of enterprises. Every cent we spend can shape the world of business and trade for the better. We are building momentum behind the idea of an economy that reflects the Fair Trade vision. If your favourite shops do not sell Fair Trade products, ask them to source from our list of Fair Trader suppliers. Be a Fair Trade ambassador, introduce Fair Trade to your friends and family.